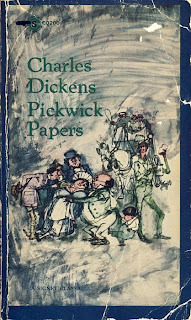 Excerpt from "The Pickwick Papers" by Charles Dickens. "As brisk as bees, if not altogether as light as farries, did the four Pickwickians assemble on the morning of the twenty-second day of December in the year of grace in which these, their faithfully recorded adventures, were undertaken and accomplished. Christmas was close at hand, in all his bluff and hearty honesty; it was the season of hospitality, merriment and open-heartedness; the old year was preparing, like an ancient philosopher, to call his friends around him, and amidst the sound of feasting and revelry to pass gently and calmly away. Gay and merry was the time, and gay and merry were at least four of the numerous hearts that were gladdened by its coming. And numerous indeed are the hearts to which Christmas brings a brief season of happiness and enjoyment. How many families, whose members have been dispersed and scattered far and wide, in the restless struggles of life, are then reunited, and meet once again in that happy state of companionship and mutual good-will, which in that happy state of companionship and mutual good-will, which is the source of each pure and unalloyed delight, and one so incompatible with the cares and sorrows of the world, that the religious belief of the most civilized nations, and the rude traditions of the roughest savages alike, number it among the first joys of the future condition of existence, provided for the blest and happy! How many old recollections, and how many dormant sympathies, does Christmas time awaken! We write these words now, many miles distant from the spot at which, year after year, we met on that day, a merry and joyous circle. Many of the hearts that throbbed so gaily then, have ceased to beat; many of the looks that shone so brightly then, have ceased to flow; the hands we grasped, have grown cold; the eyes we sought, have hid their lustre in the grave; and yet the old house, the room, the merry voices and smiling faces, the jest, the laugh, the most minute and trivial circumstances connected with those happy meetings, crowd upon our mind at each recurrence of the season, as if the last assemblage had been but yesterday! Happy, happy Christmas, that can win us back to the delusions of our childish days; that can recall to the old man the pleasures of his youth; that can transport the sailor and the traveler, thousands of miles away, back to his own fire-side and his quiet home!" Every year during the Christmas Season, an old college friend of mine and I read and ponder this piece of literature together. Sometimes we read it to each other on the phone as we are not usually in the same vicinity at the same time. It's become sort of a tradition. It's become a comforting tradition for me. This year, I am spending a moment to go back, in my mind and spirit, to my family home for Christmas. I am visiting the past with honour and respect and gladness that I once had such a loving place to be. The house was full of merriment and gladness. It was full of people who came together because they loved each other. We gathered around the family table with Christmas hats on and read silly jokes out of Christmas crackers. 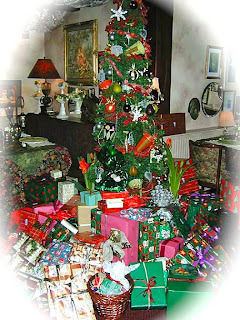 We opened copious amounts of presents because we were a large family who waited for each other to share the surprises. We laughed and made a mess. The children were in the spot light. It was a time to appreciate the passing of time and the new generations. We drank wine and drambuie. We ate large amounts of turkey, cooked and fussed over by my Mama. Dressing, sweet potatoes, mashed potatoes, peas, creamed carrots, waldorf salad, gravy, cranberries, pickles and black olives graced the table. The best china, crystal and silver were laid. In fact, the table was set the day before to perfection. Dessert was a choice of fresh blueberry, raspberry, apple, cherry and lemon pie. The flaming christmas pudding with brandy sauce was an extra. The children played, the women gathered in the kitchen to chat and clean up while the men dozed by the fire. Those were the days! It is heart warming to remember those Christmas's. The shopping, the wrapping, the anticipation, the excitement, the preparation. Just waiting for 'the kids' to come through the door, in small groups, in couples, or one by one, was a nice feeling. When we were all together, it felt complete. We were a family, with all the love, all the light and all the shadows. It was just as it was meant to be. There are no accidents. And so, I let go of the past and return to the present moment. It's a good place to be. Everything is just as it is meant to be. I am learning my lessons. Making my way. There are no accidents.